Let us make you a T-Shirt Quilt or finish your Quilt Top! Welcome to Happy Dance Quilting! We’re a small company of professional t-shirt quilt makers and can make you a custom blanket from your shirts and other fabrics. We also offer long-arm quilting and binding services for those with already pieced tops. If you’ve inherited an unfinished quilt top, we can finish it for you! T-shirt quilts and long arm quilting are our passions. We specialize in offering the best quality for the lowest price and hassle to you. Our quilts are made with premium quality fabric and careful planning, and our ordering process is easy yet flexible. Every order that enters our shop is an irreplaceable heirloom of memories, so we treat them with the customized care they deserve. T-Shirt quilts are functional art made from your awesome memories. If you or a loved one has a collection of special t-shirts, a t-shirt quilt is a great way to showcase that collection. Whether you’re looking for a unique graduation gift, a cozy way to save all those high school or college t-shirts, a thoughtful gift for that sports fan in your life or a memorial quilt to keep the memories of a lost loved one close, we’re here to make the process easy for you. All you need to do is get us your shirts! Our professional quilting process makes your t-shirt quilt especially durable, while adding the beauty that comes from quilting: there’s a reason quilts have been such popular pieces of functional art for generations! T-shirt material is pretty flimsy and prone to tearing on its own, but through our quilting process, the shirts are bound together and made stronger by a subtle sewn design all over the quilt. Your Happy Dance Quilting t-shirt quilt is made to be used and enjoyed, and will stand the test of time! Some other t shirt blankets you can get aren’t quilted. While these quilts might be the cheapest option, they aren’t made to last. The lack of quilting means your t-shirt blanket is likely fall apart over time, because those quilts rely on weak t-shirt fabric to stay together, instead of sturdy quilting. You will find that those quilts are similar to large pillowcases, and come apart along their inner seams. They also don’t use a soft, fluffy interior, so the shirts tend to look saggy. Your tshirt quilt from us, however, will contain a material called batting: this soft material provides a subtle loft to your shirts so that they look smooth and full! Wrap yourself up in your memories! We offer many options for your t shirt quilt: from premium Moda cotton fabric (for folks who want a cool blanket) to soft flannel (for someone who wants the warmest, softest quilt), your tshirt blanket can be customized to be your own. Whether you plan to keep it on the couch to snuggle under when watching Netflix with your family, or plan to send it with your new grad to be the comforter on their first dorm bed, a t shirt quilt allows even the simplest of life’s moments to be wrapped up in joy. Happy Dance Quilting tshirt quilts have kept their families warm at football games, been play mats for toddlers and even receiving blankets for newborns! Imagine all those sorority tee’s, jerseys, graphic tee’s and vacation souvenirs currently taking up space in your drawers or closet being used instead as a functional piece of art in your or a loved one’s life? One of the most special custom t shirt blankets we make are memorial quilts. Losing a family member is such an overwhelming and grief-filled event, and often, getting rid of their clothes can be a fraught experience. 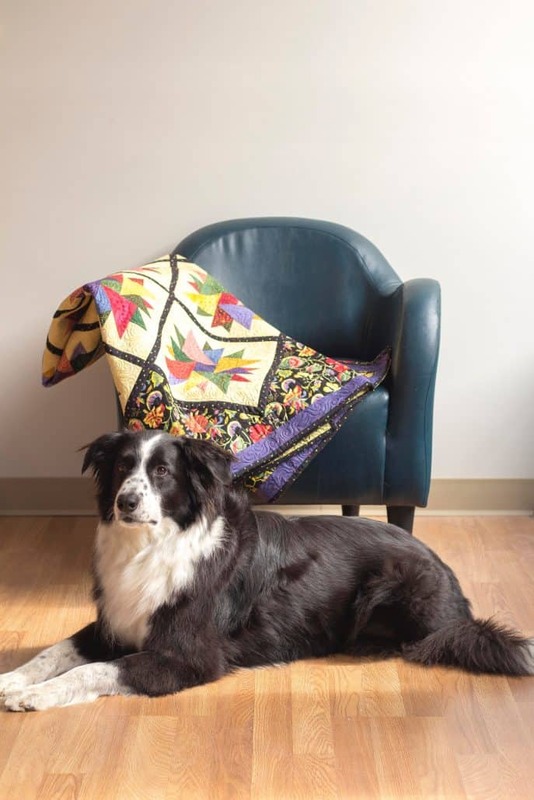 Instead of donating all their clothing, you can memorialize a loved one with a memorial quilt. This allows you to keep them close and honor their memory. With options like photo squares, custom embroidery and more, we can make a t-shirt quilt for you that truly showcases your loved one’s life and memories. Every time you cozy up in a memorial quilt, you keep that loved one close to your heart. If you’re paying to have a custom t shirt blanket made, why would you want to do the work of cutting shirts and trying to design the quilt? We do all of that for you! We have years of experience getting the color balance and layout of tshirt quilts just right, and our expert sewers know exactly how to cut shirts to make them look amazing in your quilt. The process is easy and stress-free for you: just get us your shirts and we handle the rest! If you have a specific layout in mind we are happy to use that, too! Use the menu above to browse our site. If you have any questions at all, don’t hesitate to contact us for more information, or come visit us in Louisville, KY! We’re at 650 S Shelby St, just off of Broadway. We are not a fabric retailer. We make t-shirt quilts, and specialize entirely in quilting services. If you’re looking for fabric, patterns, or lessons, we suggest The Cozy Quilter. Your t-shirt quilt is a timeless keepsake, and we treat it that way. Now offering local pickup! Let us take the hassle out of dropping your shirts off. Click here for more information.